A quiet resort enclave at the gateway to Orlando's magical parks. You reach the main gate, then the fountains, before being guided along the road to your own spectacular villa. You are not just in Emerald Island Resort, but at the very threshold of the attractions for which the city is justly famed. An extremely safe and clean gated community, patrolled 24 hours a day. Close to Orlando International Airport. A journey of approximately 30 minutes from leaving the airport to picking up your keys, then a further 10 minutes to your front door. From Kissimmee, 75 miles to the west takes you to Tampa, the home of Busch Gardens. Another 20 miles takes you to the beaches of Clearwater on the Gulf Coast. Travelling 65 miles to the east brings you to Kennedy Space Centre, launch pad to the stars. A short distance south along the coast is Cocoa Beach, the home of Ron Jon's surf shop, which has everything you could need for the beach. It is one of the most famous surf shops in Florida. One of the closest gated resorts to Disney World and the Magic Kingdom. Your villa is only two junctions from the gates of Emerald Island, to the main gates of Disney World. This means you do not have to go onto the extremely busy Interstate 4 to enjoy your day in Disney, and even better, only a short trip home at the end of a tiring day. Distance from Orlando International Airport is approx 24miles (35 minutes). 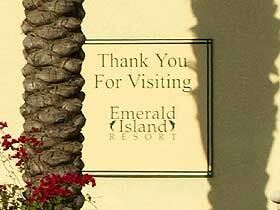 See exactly where our home is, on Emerald Island Resort using microsoft live maps. Our Home is 5 houses below the red pickup truck.